Earlier this year I began using services available through my HMO to transform my body from male to female. I’d already taken on a female name, pronouns, and presentation, and now I was changing my body itself. The process was moving along, and the reality of my new identity was sinking in deeply. It was at this moment that I begun experiencing one of the most peculiarly misogynistic television worlds of our era: that found in Hulu’s adaptation of Margaret Atwood’s The Handmaid’s Tale. To say the least, it’s bracing to watch a TV series about your country being taken over by an authoritarian government distinguished by extreme levels of misogyny and patriarchy right as you’re transforming yourself into a woman. This would have been hard enough on its own, but one of the effects of estrogen is to expand the range and strength of one’s emotions—the tried and true methods I’d used for dealing with my emotions for my entire life were now insufficient. So I was even more susceptible to a show that many critics agree is disturbing in a particularly brutal way. It hit me like no other TV I’d ever watched. Years before, I’d read The Handmaid’s Tale and had no problem imposing an intellectual distance between myself and Offred. But watching the TV series, I felt a profound vulnerability and identification. The show could make me physically sick, and it often left me with lasting sensations of disquiet. I frequently asked myself if I should really keep watching. This was no simple entertainment, it was a narrative that entangled me and made me begin to think seriously about my own safety. It was, to put it plainly, one of my first confrontations with misogyny as a female. It reminded me of something that had begun happening as my presentation had grown more and more convincing. As the world began to consider me a woman, I noticed that when I left a social gathering late at night women often sent me off with the words “get home safe.” This was memorable because I’d never heard anyone say this to me as a man. They always said it casually, almost unthinkingly, like another form of “goodbye.” It was this very casualness that made me understand that I was getting myself into something very, very real. I was making myself physically vulnerable in ways that I’d never had to think of before, and this vulnerability was quickly becoming my life. The Handmaid’s Tale made a similar impact, and this gave me pause. In all my years of wanting to be female and occasionally presenting as such, I’d never confronted misogyny in such a personal, powerful, disquieting sort of way. This was at times frightening, but it was also empowering because it made me feel I was successfully dismantling something that I feared I’d never be rid of: my male privilege. As unsettling as it was to see this vulnerability become a basic fact of my existence that could strike right down to my core, I knew that I’d have to let go of what had empowered me as a man if I was to become the woman I needed to be. I don’t want to give the impression that the arrival of misogyny into my life was the only way I knew I was succeeding in my transition—there are many other, much more positive changes I might talk about—but this is an essay on The Handmaid’s Tale, and misogyny, unfortunately, remains a fact of being female. It’s a necessary commentary on our society that every transfeminine narrative I can recall involves misogyny as a major way of recognizing that one is successfully presenting as a woman. As I continued watching the series, I began relating to Offred in unexpected ways that went well beyond the misogyny she experiences. I began to feel a kinship to her on deep levels of personal identity. Characters like Offred are in a life-and-death struggle to preserve the existence of a world and identity that Gilead’s rulers are doing everything they can to erase. 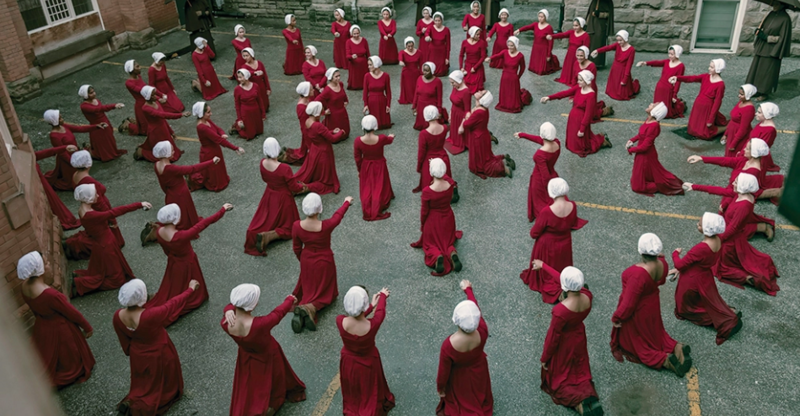 In the parlance of today’s politics, Offred is fighting to prevent Gilead from being “normalized.” She can’t preserve their former reality in tangible things like books, monuments, diaries, clothing, or written laws, so her only recourse is to keep this reality alive in her memories and beliefs. I understood this, because I had spent years fighting to believe in an identity that the world told me was impossible. Seeing Offred struggle to preserve the existence of her former self made me despise the ways in which my society had always insisted I was something that I had known in my heart I was not. Shame, guilt, humiliation, and, at times, physical and psychological threats had all been used to control me. My world had insisted that I would be a freak incapable of building a career, making a home, or having a social life if I tried to be the person I really was. Watching The Handmaid’s Tale brought back memories of that period, and it made me think of how hard I had fought to replace a reality borne of lies and indoctrination with a new one of my own truths. It was a very long, halting struggle to see these lies for what they were and to tear them from my mind. I had to do all this before I could even begin thinking of transitioning. I had to believe that I had a right to exist and could exist before I could seriously consider bringing that person in to being. I had to have a mind that was free to know itself as female, and that loved its chosen form of femininity. Now that I am finally at the point of making my body into the one I have always wanted to have, it feels as though I am extracting the last lingering, tenacious beliefs from the years in which I was brainwashed into believing I could only ever be male. It is such an empowering process, one that at times feels miraculous: every time I look into the mirror and love what I see, and every time someone genders me correctly, I make a new, correct reality. This is why I think transpeople are so sensitive about our pronouns and our names: every time one of us is called by the wrong name, it is a reminder of those years of brainwashing, and it can undo hard-fought, fragile victories. I think that these feelings of fragility, vulnerability, and tenacity are things that Offred would understand. This is what makes her character so compelling to me—the fighting spirit that defines her as a character, the very human ways she invents for protecting her true identity and preserving her hope in the face of seemingly impossible obstacles. Even though I no longer believe that the obstacles between me and my true gender are impossible, change comes slowly to my body. Nothing in my life has made me as aware of the passage of time as transition—it requires a great amount of faith and patience, and it has often felt agonizingly slow. So many mornings I’ve looked into the mirror in complete exasperation and defeat, feeling cursed by features that mark me as the wrong gender, thinking that no matter what I do I will never really succeed. I am always aware that the task of changing genders once seemed to me the most impossible aspiration, one that was too shameful to think about, much less speak aloud. My world had insisted that my existence would always be limited by a decision some doctor had made in the first hours of my life. Even today, there are still so many forces in my culture that would like to force me back into that place of pain. But it has been long enough since I last thought of myself as male that I can see this new normal beginning to replace the old one. As my facial features have begun to soften, my body assume a new shape, my skin grow soft, and my speech patterns sound more and more like myself, I can see my mind getting distant from the days it thought itself to be male. Week by week I feel more and more empowered. I am setting myself free. These days I use the dressing rooms and bathrooms that I want, and I’ve built the foundations of an unshakeable new identity. I’m learning to deal gracefully with the misogyny that has begun to appear in my life, and I will not ever let it make me doubt my decisions or soften my resolve. I am here, asserting the reality of my existence. This is one right that each of us has in a free society, no matter how many barriers might stand in our way. It is something Offred misses so dearly. We can define how we want to see the world and ourselves. That is what I’m doing now, I’m seeing with eyes I never knew I possessed, amazed by just how possible all this is.